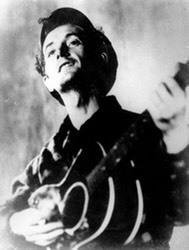 "The Life & Songs of Woody Guthrie" is a scripted, 55-minute presentation which includes a biographical background on Guthrie, readings from his vast collection of essays and letters, and of course, lots of great songs from America's iconic folk ballad maker. Chicago's Mark Dvorak performs eleven of Guthrie's most well-loved songs, accompanying himself on guitar and 5-string banjo. Dvorak has been active on the faculty at the Old Town School of Folk Music for more than twenty-five years, where he was recently named Artist-In-Residence. WFMT 98.7 fm also recently named him "Chicago's official troubadour." He has spent a lifetime following in the musical steps of Woody Guthrie. Download and print a sample program here.